Across the country we are experiencing a crisis — a caregiving crisis. Individuals with disabilities are the largest minority in the U.S., comprising about 20 percent of the population, and baby boomers, the largest generation in the country, are aging. These two groups do or will rely on caregivers to live independently and maintain their quality of life. 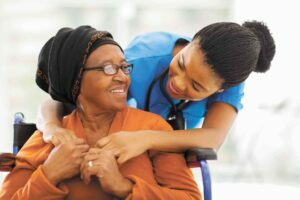 Categorized by the U.S Bureau of Labor Statistics as personal care aides, caregivers go by many names and work in many industries. Caregiving is one of the top five fastest growing professions in this country and is projected to be number one for the most new jobs from 2016 to 2026. Our need for caregivers is rapidly increasing, yet our all-time-low unemployment rates mean that filling these open positions is a challenge. Direct Support Professionals (DSPs) assist individuals with disabilities across a variety of settings throughout their day and with a wide array of tasks. This is not a glamorous job. It has an average starting salary just above the federal poverty line for a family of three and is often funded through a mix of federal and state tax dollars. The services that DSPs provide are vital to the happiness, well-being and overall quality of life of the people they support. DSPs are not only responsible for meeting basic needs and ensuring health and safety, but, in many cases, they act as teachers, role models, counselors, mentors, advocates and friends or extended family. Nearly 20 years ago, I entered this field as a DSP, and my reason was simple — I wanted to help people realize dreams and discover abilities that other people had written off for them as impossible. I’m able to do this through my work with Tangram, an organization that supports people with disabilities in every aspect of their life. Tangram’s DSPs assist adults with intellectual and developmental disabilities in home and community settings so they are able to achieve personal independence. While being a great DSP doesn’t require a certificate in many states, it does require someone to have certain attributes and skills, many of which cannot be taught: genuine kindness, patience, empathy and a willingness to learn, among others. In our rush to fill open positions, we run the risk of not hiring the right people. And what does this mean for the elderly and those with disabilities, two of our most vulnerable populations? It means that our loved ones — our elderly parents, our grandparents, our neighbors, coworkers, friends and family members with disabilities — are at greater risk for neglectful and dangerous situations. When we fail to recognize, support and invest in our caregivers, we fail to value the lives of the people we entrust to those caregivers. With DSP Recognition Week earlier this month, now is the time to reflect on the positive impact that could be achieved if we, as a culture, gave caregiving the respect it deserves.